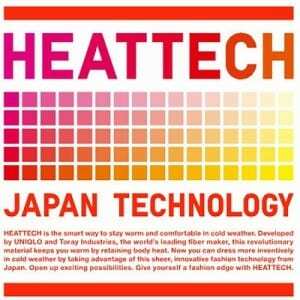 Does Uniqlo Heattech Heat-Generating Clothing Actually Create Heat? The concept behind Uniqlo Heattech is an interesting one: what if you could wear less bulky clothing, and still feel warm during the cold months. The explanation for how it works looks something like a science project, with graphs and figures, but how well does it really keep people warm? There are those people that seem to run hot, with plenty of heat to spare they act like virtual furnaces. But for the rest of us that seem to run cool or cold, the slightest chill will make it so we’re reaching for a sweater and wondering why we live in such a cold climate. Uniqlo, the makers of the Heattech line, claim that their clothing actually creates heat using the moisture from your body. They go on to say that the heat it creates is then stored in pockets so it not only creates heat, but stores it so that you can continue to stay warm and cozy. They say that all of their items are made out of durable material, so you don’t have to go easy on them and they’ll last through several washings and wearings, and keep their thermal nature. Even though they’re durable they maintain their soft texture, so they feel good while being worn, and are something you’d like to wear rather than something you dread wearing. This is another example of a product citing Japan as the source for its technology. For whatever reason Americans have a certain affinity for Japanese goods, giving them a lot of built-in credibility and endowing them with a certain sense of know-how and effectiveness. They seem to be leveraging this as much as they can, incorporating Japanese letters in their logo and blatantly stating that the technology behind it originates from Japan. Much of the Uniqlo Heattech product line is in the $20 range, with some of their items going for less. The clothing costs the same for both men and women, and compared to other competing products seems more than reasonable. Typically with a product like this that is trying to incorporate science and technology into their items you’ll see inflated prices, but these seem to be an economical way to stay warm and toasty without having to spend a ton on clothing. All that you’d really need to commit to is wearing this instead of whatever you’re currently using to create a base layer in cold weather. It’s a true set and forget type of product, and once you get used to putting them on you’ll probably look forward to that part of your routine, as you know that it will provide you with the warmth you’re seeking on those chilly days. Regardless of the facts and figures the company supplies on their product, the real litmus test is what users of the clothing think about how it feels, how it looks, and how warm it keeps you. After seeing several reviews on this from those that have gone ahead and purchased it, it’s clear to see that there aren’t many naysayers, and most say that the items are well-made, fit well, and do indeed keep you warm. The only complaints that we could find was that they don’t have a large enough selection of items, but they seem to be doing their best to rectify the situation by expanding their line. They currently have long johns and casual tops for men, and for women the options range from turtlenecks to camisoles, so they pretty much have you covered no matter which look you’re going for. These appear to be the base layer that you’ve been looking for. If you’ve always wanted to wear long johns or thermal underwear but didn’t want to add bulk to your look or thought that they didn’t keep you warm enough to bother with, this is something that’s worth a try. The company says you’ll be able to wear fewer layers than you normally would, and because of this you may be able to wear more fashionable clothing when everyone else is wearing thick bulky sweaters and jackets. This could be the start of a new “winter chic” look, and allow you to look stylish year round. Uniqlo Heattech is getting our Thumbs Up rating. It works! The reviews are in from several reliable sources, including third-party users and professional clothing reviewers. The items they provide are made of high quality materials, and at this price point there isn’t really anything comparable. Of course there are thermal underwear out there that provide a similar thinness and excellent warmth creation, but you’ll end up paying far more for them. Perhaps they are simply trying to establish themselves in the market and are undercutting the competition, but this provides a great value to the consumer, which is another reason we like it. These are winning fans left and right, and it seems that Japan has done it again, coming up with a new way to keep the body warm without having to wear big bulky clothes. It’s best to keep reasonable expectations though, and realize that while these may be able to keep you warmer, you may still need to wear thick and warm outer layers depending on how cold it gets in your neck of the woods. But as far as your options go for creating a nice base layer to start with, these deserve a trial run. What do you think? Does Uniqlo Heattech work or not? I was excited to find thin shirts which are still supposed to keep you warm. However, the Heattech shirts are treated with biocides (Zinc Pyrithione / 3-trimethoxysilyl Propyldimethyloctadecyle) supposedly for preventing odor and “durable against daily washing”. VERY DISAPPOINTED! Especially as this fact is concealed on the homepage as “odor-minimizing fabric”. Interestingly, on the packaging itself there is a clear warning “This product contains the biocide XY”. I would have never bought this product if I had known this in the beginning. Who wants to have biocides directly on his skin every day? I am with you! I do not want to put that on my skin, either. Thanks for your review! Thank you Ann for this valuable information. I’m sure there are organic alternatives maybe Hannah Anderssen? Thank you for this helpful information. I don’t understand the hostility of those who reject it, it’s really a matter of making an informed choice. And thanks to you we can choose wisely. You’re ignorant. The proof is in the science. You have a Caveman mentality of thinking if you think this isn’t possible. Seriously? Do you really believe that?? I mean haven’t you ever used an instant heat pack?? It really works. My fingers would turn white and hurt and get numb. now that i use the heattech gloves i am warm and my fingers are ok. great price also.onlt ten dollars for these great gloves. This is called Raynaud’s syndrome….. I just got this shirt has a Christmas gift and I must say I’m disappointed, wish I could return it but once you open it.. my wife was not sure if it I was a medium or large and she is not the one to eat the cost if I was given the wrong size but the medium fit me fine. My home was a toasty 55 degrees and I took off my short sleeve cotton shirt to try on the long sleeve heattech one. After 10 minutes I had to change back because I was freezing to death! The shirt just felt cold on my skin, I had to check the package, I was wondering if my shirt was in reverse and keeping me cool like its summer, ha ha. I run a lot and I needed something thin and light so I ran in it under my running shirt yesterday. I didn’t feel any noticeable differance and it was pretty funky after my run. I can’t take it back so I’m gonna get the most out of this shirt and send a review again in a couple of weeks. Hahha, I kept laughing non stop when reading your comments. Bye bye Uniqlo then. I purchased the Heattech undershirt. The product does not work. A limited amount of exertion resulted in the undershirt getting wet, it retains sweat and looses all its ability to retain heat. It also takes a while to dry. Unless you are wearing it to stand at the street corner it is useless. However, you get what you pay for. I do not like the fact that you cannot return it. It should be noted that I own a number of their products (sweat pants) and am satisfied with them. I LOVE heattech, I am soooo amazed by how well they keep me warm & How Comfortable both their leggings & shirts are, that I can not stop talking about them, I tell everyone I know, & have posted their products all over facebook. Absolutley AMAZING product. Did I say, I LOVE THEM. I can read here comments with some mixed emotions about “chemicals” being used (really ? ok ! )…if anyone is indeed so much concerned about it, then why not to wear that Heattech “chemical” (?) shirt on a top of just a regular shirt – problem solved ! I just bought that light down parka on sale for $70 can$ at Eaton Centre in Toronto (regular price was $100) and it is just amazing – very thin, can be rolled into a small package of a fist size, and I incredibly warm – wearing just a regular cotton t-shirt underneath and this parka on top at 1 deg.C outside for half and hour walk and – I was just fine ! I just give it 5-stars. Bought the Ultra Warm Heattech Men’s L/S T-shirt and pants. Sizing is somewhat off since it’s really based on Japanese sizing. A men’s 44-46 is In-between sizes for a shirt so one can either buy a Large or XL size depending on preference or fit. A large sizes fit me though it’s more snug while a XL was looser. A men’s 36 waist sizes is actually an XL and it’s still relatively snug. Can’t imagine the fitting of a Large sizes pants. It’s relatively warm if you use it as a base layer under other clothes and go outside. The shirt does hold in sweat so you may/may not feel relatively clammy/wet. But it’s NOT (that) warm if you use it as loungewear by itself or even sleepwear especially on COLD, WINTRY nights! Best to wear Fleece shirt/pants combo for sleepwear on such cold, wintry nights while using a down comforter and flannel shirts for proper warmth and with some heat on overnight. It’s not good for sleepwear when temps are in =<30s F but it OK when it's in the 40s-50s F though you'd still want to use a thick blanket and warm sheets for added warmth! How warm you feel with Heattech also depends on your tolerance to cold temperatures. I feel cold easily and regular Heattech leggings worn under light-weight skinny jeans aren’t warm enough for temps below 45ºF. I had to double up using 2 pairs of regular Heattech leggings. Their knit leggings are more warmer although a bit more bulkier. I also own two regular Heattech turtlenecks in medium and large. The medium works better, I think because you need a snug fit for the technology to work. The fabric feels really soft like rayon but I’m not too impressed with its performance. A regular cotton long sleeve top does the job just as well at keeping me warm. Which one can withstand a -6°C a 1.5x heatech leggings or an ultrawarm?